Stagecoach has announced a £3.2m investment in a fleet of Britain’s biggest coaches as it continues to meet growing demand for its market-leading inter-city travel service megabus.com. A fleet of 11 15m-long coaches equipped with free wi-fi will be delivered in December and introduced on megabus.com routes covering Scotland and England. Megabus.com now covers around 60 locations across the UK and carries around 5 million passengers a year. Manufactured by Alexander Dennis Limited, the Plaxton Elite i coaches have 75 seats, offering more than 20% extra capacity than a standard 15m vehicle and more luggage space. The first of the newly designed vehicles seen out on trade plates. The new coaches provide roll-on level access for wheelchair users and other passengers with disabilities, eliminating the need for a special wheelchair lift, and also feature tinted double-glazing and a toilet. The vehicles will operate mainly on two routes: Glasgow - Edinburgh - Newcastle - Sheffield – London; and Preston - Manchester – London. They may also be used on some London - Leeds and London - Exeter - Plymouth services. 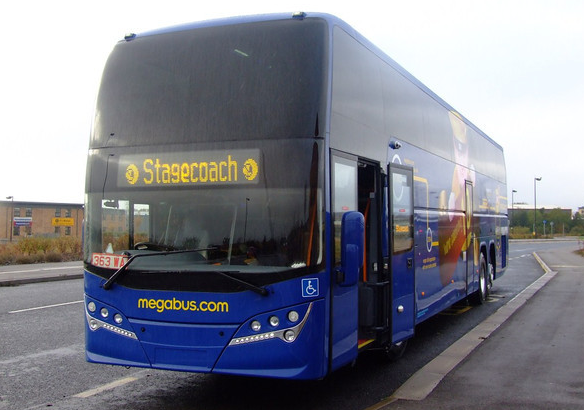 Included in the order is a coach in a special metallic version of the megabus.com livery to mark the 10th anniversary of the budget service in 2013. Ian laing, General Manager for megabus.com, said: “Demand for great value inter-city travel just keeps on growing, especially with the rising cost of owning and running a car and the further stretch on household budgets. These new state-of-the-art coaches will deliver more capacity on key routes we operate in the UK. "We have worked closely with Plaxton over the past 10 months on developing this new model. It sets new standards of accessibility for our customers with impaired mobility, as well as offering great comfort all round. The new fleet will also provide even greener travel for our customers and a lower carbon footprint for our business." The Elite i higher-capacity coach will deliver lower per passenger emissions than standard coaches. Powered by a 10.8-litre Euro 5 engine, the vehicle is based on a tri-axle Volvo B11RT underframe.